A two day fast pace intensive drills and skills course designed for existing Close Protection professionals wanting to expand their Close Quarter Tradecraft, also SIA level three holders wishing to advance from the basic licence course. Close quarter armed and unarmed drills and techniques designed to cater for the CPO who finds himself alone with a Principal and or at best with one other CPO. 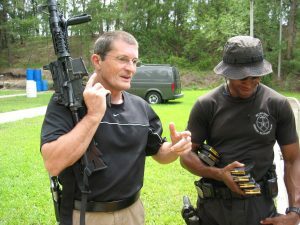 Although entitled “FAST PACED” the course is about progressive learning and understanding the SKILLS of unarmed and armed techniques needed to operate within a close quarter environment. Course content: Close Quarter Combat Pistol drills and techniques from concealed carry. Close Quarter Defence of a Principal from armed and unarmed attacks. Extraction and protection of a Principal from an immobilised vehicle under threat. The weapon drills and skills taught on the course are an absolute essential for live fire Close Quarter Combat in a CPO role. Once the individual CPO has achieved competency with the skills and techniques taught it will enable those male and female who wish to, to use their acquired knowledge on a further course at an appropriate firing range. The venue is in South Wales with accommodation provided. Participants must have proof of CP employment or SIA level three licence. The course is limited to 10 participants on each course to ensure personal tuition from Mick. Participants need to be physically fit and be prepared for realistic training. By completing the drills and skills on the advanced close quarter CPO course here in UK, advancement and achievement is much quicker, much safer and a lot less expensive! To ensure continuous professional development after the completion of the two-day drills and skills course a further one-day “refresh and progress day” will be available throughout the year and is unlimited to the amount of times attended. Note: The next available courses start in April 2019. If you would like to express an interest please click on the contact link and send your details.